Simplicity and elegance combine in the perfect lines of the Centra vanity by the Wyndham Collection<sup></sup>. If cutting-edge contemporary design is your style then the Centra vanity is for you - modern, chic and built to last a lifetime. Featuring soft close door hinges, drawer glides, and meticulously finished with brushed chrome hardware. The attention to detail on this beautiful vanity is second to none. Available in several sizes and colors. The Colton 60 inch vanity captures attention with its stunning Basil Green finish, brushed nickel hardware, and lovely louver doors. But Colton's construction is equally as compelling. Solid birch wood frame, dovetail joints, soft-close glides and hinges, plus flip-down drawers beneath the sinks means Colton delivers quality in both form and function. Complete the look with matching mirror and linen tower. You cannot miss with Colton. Graceful lines and gorgeous details give the Giselle Collection an aesthetic you will not find in your average bathroom vanity. With matte gold hardware and a stunning natural walnut finish, the Giselle 43 inch vanity commands attention without being ostentatious. An open shelf and roomy soft-close drawers deliver ample storage. Giselle transforms a blah bathroom into a luxurious spa. Pair it with the matching mirror to complete the look. Elegant and Functional. Those are the criteria that guided us in creating the Riley 37 inch vanity combo. With its clean transitional lines, pristine white finish, gray quartz top, and refined brushed nickel hardware, Riley embodies a contemporary aesthetic that dazzles in multiple design settings. Generous storage features include soft-close doors and drawers with removable organizer trays. Match the Riley vanity ensemble with the complementary mirror and linen tower and you have a pretty and purposeful package. Put Riley in your bathroom and put your mind at ease. 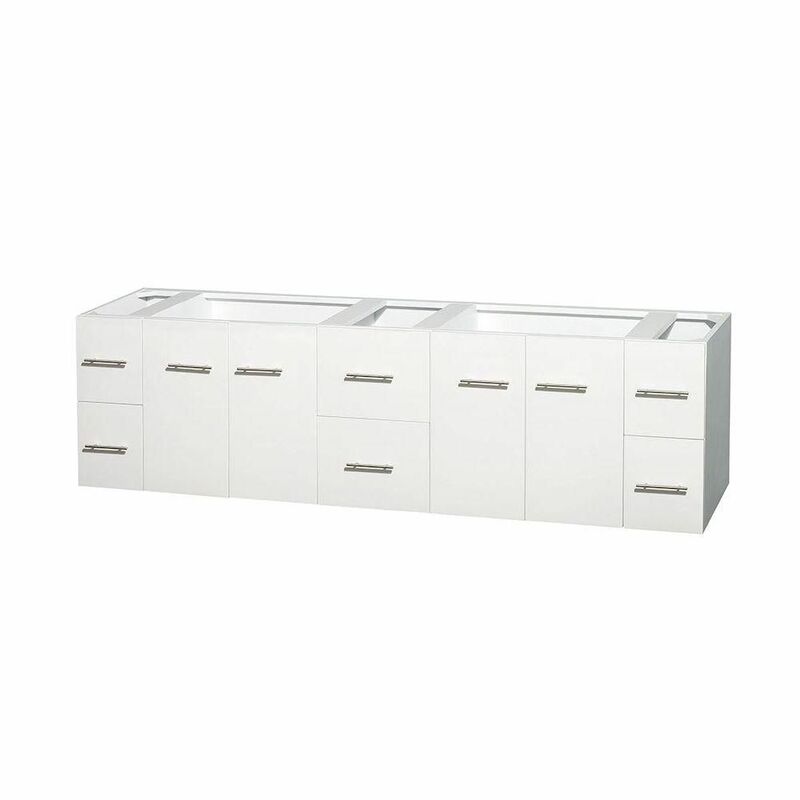 Centra 80-Inch Double Vanity in White Simplicity and elegance combine in the perfect lines of the Centra vanity by the Wyndham Collection<sup></sup>. If cutting-edge contemporary design is your style then the Centra vanity is for you - modern, chic and built to last a lifetime. Featuring soft close door hinges, drawer glides, and meticulously finished with brushed chrome hardware. The attention to detail on this beautiful vanity is second to none. Available in several sizes and colors.